We'd like to give a huge shout out to the members of the Grant County Bar Association! For several years now, they have sponsored and presented an annual Law Day program for the 5th-grade students at our schools. judge, the plaintiff’s attorney, the defendant’s attorney, and witnesses. This is a great way for the students to learn about the legal system in a fun and interactive setting. 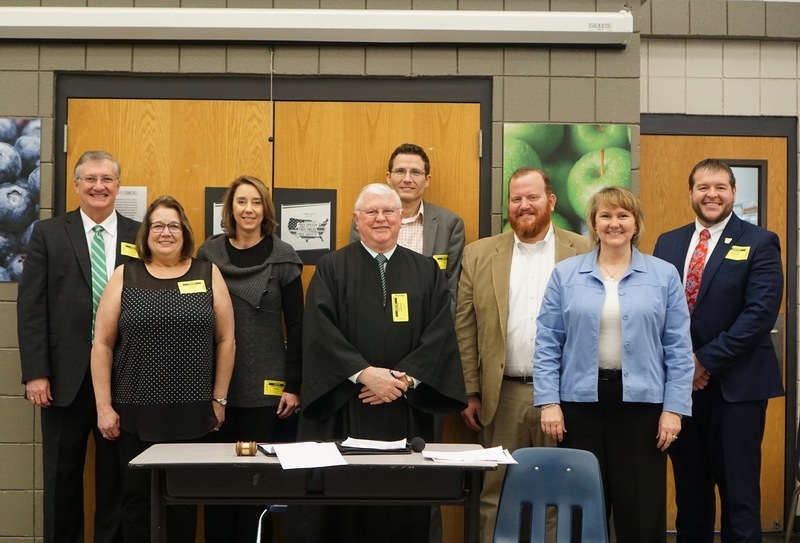 The bar association will perform the mock trial at the courthouse for EEI 5th grade students on May 1, which is the nation's official Law Day. Shown in the group photo, from left to right, are Attorney Ed Koon, Coordinator Karla Koon, Prosecutor Teresa Howell, Judge Phil Shirron, Attorney Chris Goins, Deputy Prosecutor Norman Frisby, Attorney Margaret Dobson, and Deputy Prosecutor Stephen Shirron.